Lakeland Mills Cedar is naturally resistant to decay and insects so it makes a perfect choice for outdoor lawn furniture and garden accents. Our Cedar and Pine logs are a renewable and environmentally safe resource as by-products of the home and plywood industry. Enjoy the subtle grain beauty and solid comfort feeling of Lakeland Mills outdoor furniture which if left unstained will weather to a lovely gray patina. 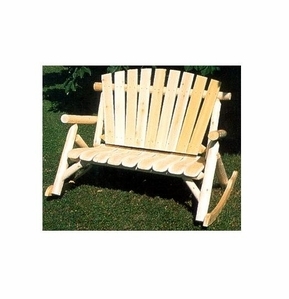 Our quality craftsmanship and contoured seating assure years of enjoyment.